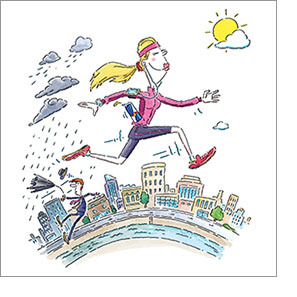 Experience shows that the last few days before the marathon are often marked by pre-race fever and a certain level of excitement—all completely normal and conducive for such a big running experience on Sunday. Give your legs a break (especially on Saturday) and tour Berlin by bus rather than by foot. One good tip for everyone: If you are arriving by plane, put your running shoes and gear for the marathon in your carry-on luggage to ensure you have it here for the race if the airline loses your luggage! We wish you all trouble-free travels and a comfortable stay in the capital. Welcome to Berlin! You pick up your bib number and race kit at BERLIN VITAL Sport and Health Expo (Thursday thru Saturday) in STATION Berlin, see map. Please come by on Thursday or Friday if at all possible, as Saturdays are usually very full and you can expect long lines, especially between 10 am and 2 pm. + Race kits must be picked up in person. No group pick-up or power of attorney. + The start pass is required, as well as a photo ID (personal ID, passport, driver’s licence) for pick-up. + Each runner receives a soft wristband when picking up the race kit. You must wear the wristband on the day of the event to get into the start area. Please do not remove it until after you have exited the finish area after the race. The durable, soft material also makes for a nice memento of the 2017 BMW BERLIN-MARATHON. + You will receive a clear bag with the race kit, which you should use for any personal items you wish to take into to the pre-start area on Sunday. This will speed up the check-in process at the starting area (bag control). + No backpacks, suitcases or luggage are permitted in the starting area. + The start/finish area is widely fenced off. Please check the map for the best path to the start. Further important info can be found here. This year BMW created a special gift for all participants of the BMW BERLIN-MARATHON 2017. 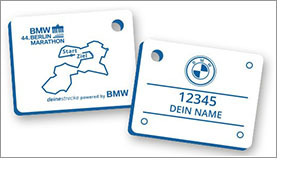 As personal memory of the biggest German running event BMW provides one individual pendant for each runner. It can be engraved with name and bib number at the BMW expo booth. 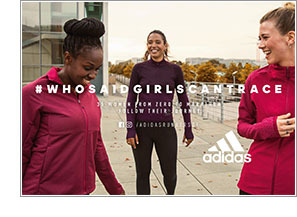 Marathon day is almost here and with it the end of a long six months journey for the #WhoSaidGirlsCantRace particpants, who are preparing with the adidas Runners for their first marathon. A journey with many ups and downs, desperation, pleasure and achievements. Sounds familiar? Are you also heading for the great finishing line called marathon? Then it’s high time to: show motivation, willpower and physical and mental stamina staying power. The marathon legend and pioneer Kathrine Switzer serves as a prime example. She was the first woman to run and complete a marathon at a time when women were not officially allowed to compete in this type of sports event. Don’t miss out! On the 21st of September she will give a motivational talk at the adidas running store in Berlin Mitte (Münzstraße 14-16). We are pretty sure: Kathrine Switzer will cast even your last doubts aside! We’ve got one more highlight for you that will also take place at the adidas running store on the 25th and 26th of September. Make sure not to miss it: Open your marathon starting bag, find the miTime wristband, bring it to the store and get it laser engraved with your personal finishing time. Follow the journey of the #WhoSaidGirlsCantRace Participants on instagram. The final countdown is on! Your big race is just days away. You have trained tirelessly. You are ready. 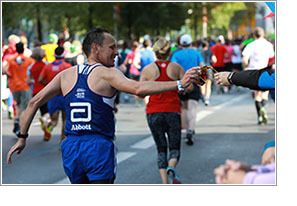 At Abbott, we celebrate what people can achieve when they’re at their healthiest. We keep your heart healthy, nourish your body at every stage of life, help you feel and move better, and bring you information, medicines and breakthroughs to manage your health. We work every day to help people like you live your best life. Good luck on race day. We’ll be cheering for you! Link. 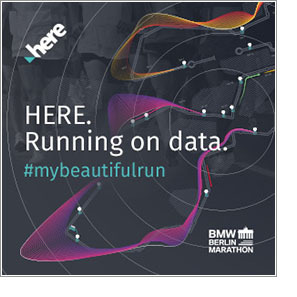 HERE is featuring 50 selected runners and will display their performance data and experience live on a large screen located between the 38.8 km mark and Leipziger Platz. The HERE marathon runners will be equipped with a Huawei 2 4G watch, loaded with our leading HERE positioning technology. Throughout the marathon, runners and viewers will see live runner data being translated into stunning visualizations. Upload your own experience from the marathon on Facebook and Instagram with the #mybeautifulrun hashtag. The official partner and timekeeper of the largest marathons in the world, Swiss luxury watch manufacturer TAG Heuer, has been demonstrating its commitment to running for two years now, supporting the 44th BMW Berlin-Marathon for the third time this September. The current slogan #DontCrackUnderPressure perfectly encapsulates the ethic of continually pushing beyond the limits. This is more than just a claim: it is a powerful mindset that is also perfectly manifested on the track by all runners. Berlin is ready for its annual running spectacular: the German capital awaits its street heroes. 42.195 kilometers full of passion and emotion separate the runners from their goal. And they can expect the perfect motivation boost shortly before the finishing line with the ERDINGER Alkoholfrei PowerZone. MC Mike-Mike, DJane Lemongrass and a professional cheerleader performance are set to mobilize the last reserves in the race to the finish. And then at the finishing line, the sporty thirst-quencher ERDINGER Alkoholfrei will be there to give all athletes a crowning reception – finishing couldn't be sweeter! This year Taiwan Excellence is partner of the BMW BERLIN-MARATHON for the third time in succession and will be present at the BERLIN VITAL. Visit the booth in Hall 7, capture your personal finishing moment prior to the marathon in a flipbook and explore the most innovative Taiwanese products. While the race Taiwan Excellence will be at the track to incentivize you for the last part of the race together with your fans at the hotspot between kilometer 40.5 and 41 (Mohrenstraße/Markgrafenstraße). Red Bull gives you wiiings® – Top athletes all over the world know this. But Red Bull has always been the first choice of many pros and amateurs at the Berlin marathon. Especially, when they need extra wings on the last miles. No matter if pure or mixed with water - one thing is certain: vitalizes body and mind®. For those who want to find out more about what is going on at Red Bull – check out redbull.com. 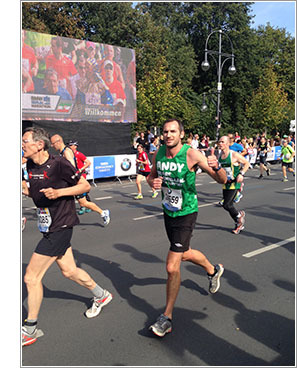 The Realbuzz Group are the official Charity Partner of the BMW BERLIN-MARATHON, and we want to wish a great big ‘good luck’ to every single fundraising hero who is running the race for charity next weekend! 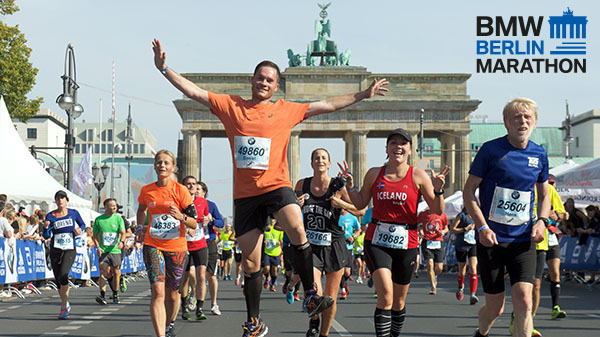 If you feel inspired by this year’s charity runners, a range of fantastic charities have guaranteed entries for the 2018 BMW BERLIN-MARATHON. Check the listings today to find a cause close to your heart, and be one of the first to secure your place in next year’s race. Marathonfoto® is your Official Photographer! We will take photos at several locations along the course, at the finish line and post finish area. We look forward to seeing your big smiles! Stop by our booth to view our products and to take advantage of our special pre-race offer. On race day, remember to keep the bib number on your chest and visible so we can assign your photos to our website. The Bambini kids have already completed seven out of nine Bambini races. 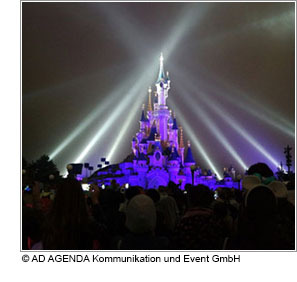 And now, everyone who has been participating consistently is in with a chance of winning the fantastic top prize: a trip to Disneyland Paris! The offer is for two children and two adults, and covers entrance tickets, flight costs and accommodation money. Anyone who takes part in at least 6 of the races can send in their trading card and might just be the lucky winner! berlinovo – a partner of the Bambini Running Series – is sponsoring this prize, because perseverance in sport should be rewarded. If you don't want to receive further email newsletters, you can unsubscribe here.